The conversation usually starts as I load ten pounds of pastured butter into my cart. Soon, the small butter talk turns to backyard chickens, homemade make-up, and raw milk. By the end of the conversation, the kind shopper once intrigued by butter, is convinced I live life from a chapter of The Little House on the Prairie. Trust me, fellow shopper, our life is far from Little House. I use a washing machine. It’s true. And the hard-working machine I dearly call “the dryer” is one of my best friends. Long flowing skirts are far from my normal attire. Hello, yoga pants. But, the deal breaker in all of this comes down to one little word. The “B” word. Here’s the truth. I don’t bake my own bread. The one thing every all-natural, homesteading mommy should spend countless hours making for her family. The last couple years, I’ve been delightfully satisfied with a local baker’s artisan bread . I look forward to waking early on Saturday morning to visit the farmer’s market and the booth where my favorite baker sets up shop. The organic sourdough selections stacked neatly on top of each other. Who needs to spend hours in the kitchen making homemade bread when warm loaves are awaiting every Saturday morning. Sadly, last month, I had to say “good-bye” to my Saturday morning stops at the baker’s booth. The expense of $6 a loaf is more than my new monthly budget can handle. With a bread-loving three year-old and three other humans to satisfy with a daily ration of gluten, I’ve turned to my kitchen and fully embraced the art of bread making. Embraced life “on the prairie”, modern day yoga-pant-style. This whole wheat bread is soaked to make it easier to digest and nourishing for the body. Soaking grains breaks down the phytic acid allowing for easier digestion. In fact, many people who can’t tolerate bread made with wheat, can tolerate soaked grains, making for a happier gut. Read more about soaking grains here. The end result is an easy-to-make bread that’s fluffy and light, perfect for toast, sandwiches, french toast, or perfectly sliced with a big slab of pastured butter. Note: This recipe makes two loaves of bread. I make one a basic sandwich bread and the other Cinnamon Raisin Bread. The end result is an easy-to-make bread that’s fluffy and light, perfect for toast, sandwiches, french toast, or perfectly sliced with a big slab of pastured butter. In the bowl of a stand mixer (or a standard bowl using a wooden spoon), combine the milk, water, vinegar, and flour (one cup at a time). The dough should be sticky and a bit stiff. Cover the bowl with a towel. Allow to sit overnight 12-24 hours. 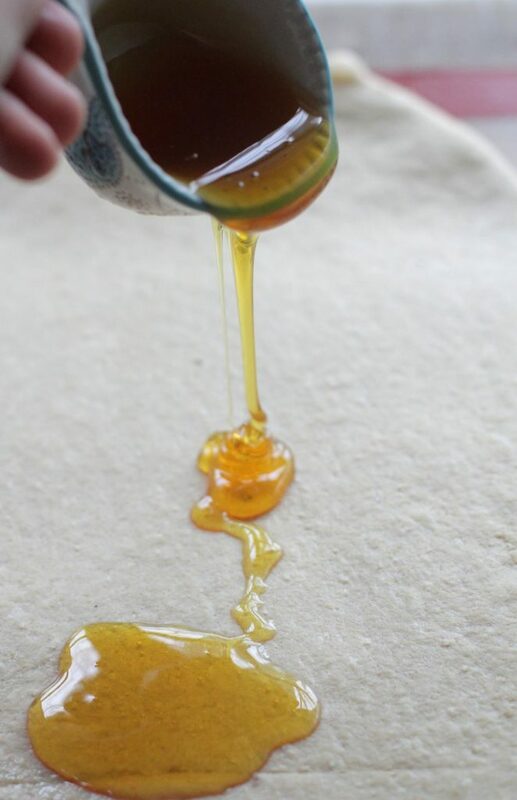 After soaking the dough, add the honey, salt, and yeast to the flour mixture. Attach the dough hook and knead dough for 8-10 minutes. 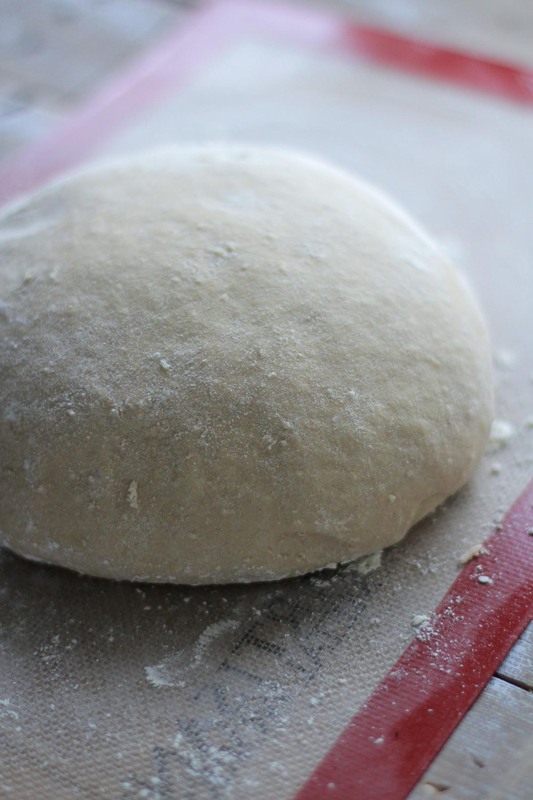 Depending on the flour, you may need a 1/2 cup more to reach a stiff, workable dough. Cover the bowl with a towel. Allow the dough to rise in a warm place for 1-1 1/2 hours. The dough will double in size. Once doubled in size, gently punch down and form the dough into two equal balls. For sandwich bread: Using a rolling pin, roll one ball into a rectangular shape. Roll the flatttened dough into a loaf and place in a buttered bread pan. 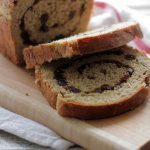 For cinnamon raisin bread: Using a rolling pin, roll one ball into a rectangular shape Spread the flattened dough with honey, sprinkle with 2-3 teaspoons (depending on preference) of cinnamon, and 1/2 cup of raisins. Roll the flattened dough into a loaf and place in a buttered bread pan. Allow to cool for 15-20 minutes before slicing. Makes 2 loaves of bread. Thank you :). I really enjoy baking bread. It really is such an art. I guess the time is what’s always intimidated me. I’ve got this baking in the oven right now!! So excited to start making my own “real” bread. Thanks for your blog and all the work you’ve poured into it!! It’s truly inspiring and beautiful, just like you. Thank you, Renee :). Enjoy the bread!! You totally got it ;). I’ve seen your gourmet ice cream. You can do bread! 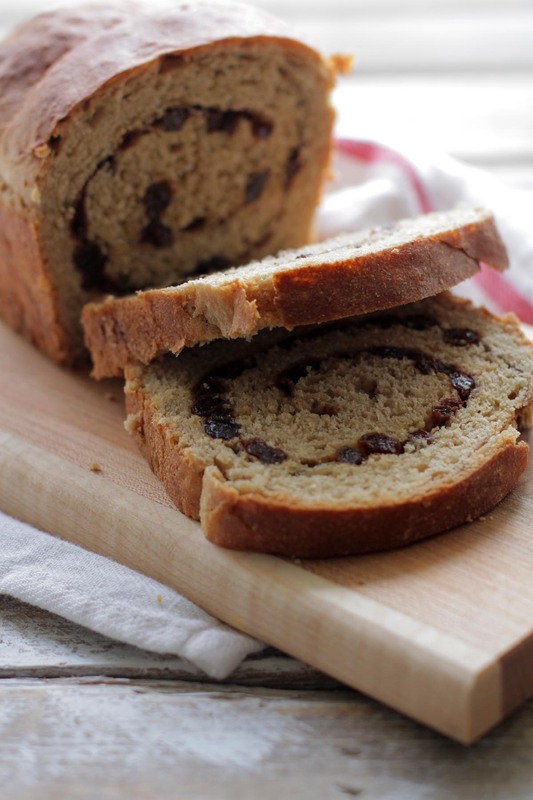 I love cinnamon bread and this looks amazing. I have never soaked grains before but will have to try soon. Thank you :). We started soaking grains a couple years ago and have noticed a huge improvement in the way they make us feel. It really is so easy. Truthfully, the idea still intimidates me even though I’ve been soaking for a couple years. I don’t know why, because it really is simple. This looks great Kristen. My family absolutely LOVES your overnight cinnamon rolls so I’m definitely trying this! And I’m with you on not baking my own bread. I used to when I first got into healthy living, but got away from it as I had more kids… besides it being time consuming. Now with needing to soak grains… I’ve just not gotten on board with it although I really want to. I suppose it’s like anything else in life… I need to prioritize and work on being more productive. Plus getting my little helpers involved! Thanks!! Thanks, Meagan. I got out of the bread baking too, the reason I haven’t been making any. But, now, that I’m back into it, it’s been pretty easy. The kids like helping too. The soaking I’ve found has really helped our digestion too. So the next morning, I just sprinkle the yeast on the dough along with honey and salt? Or do I need to add the yeast to additional warm water first to activate it?? Trying this for the first time today! Thanks!! Hi Alecia, Just sprinkle the yeast, honey, and salt over the soaked dough and knead by hand or with your mixer and bread hook. The yeast will work its way through the dough. No need to proof it in water :). Do you soak on the counter overnight or put it in the fridge because of the milk? Would this differ I I only have acces to organic or almond milk and not raw? Hi Allie, As long as you use an acidic medium, such as the Apple Cider Vinegar, the milk is perfectly fine on the counter. I’ve never tried almond milk, but any cow or goat’s milk (even pasteurized) works great. Wonderful, I will try this tonight. Thank you! Came across this recipe and thought I would try it with almond milk. On my counter now. We’ll see tomorrow. What are your thoughts on converting this to a bread machine recipe? The time commitment has always been rough for me, and I never get dough kneaded as well with a stand mixer as my Zojirushi does, especially with whole wheat flour. Think I could soak it and then put it in the bread machine? Hi, I have a Zojirushi too, but haven’t tried this particular bread in my Zojirushi. I think it would work great, just soak first and finish off with kneading and rising and baking in the bread machine. Let me know how it goes. 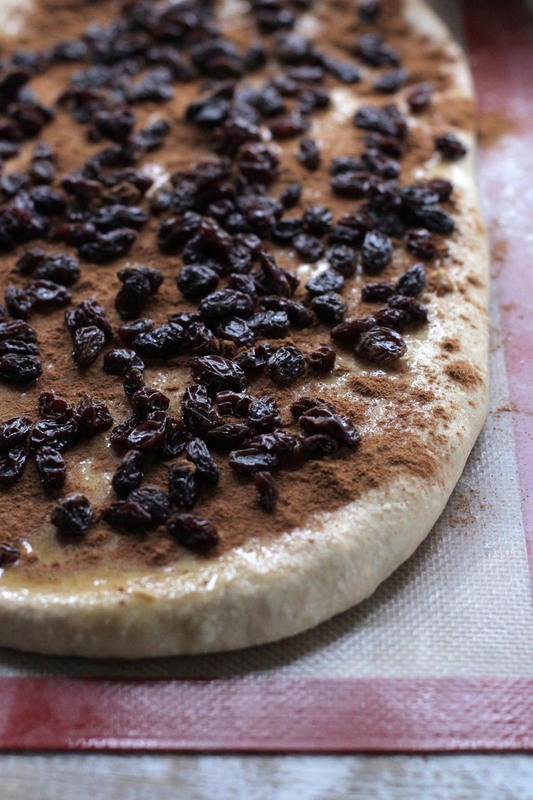 For the cinnamon-raisin version, is it 1/4 cup honey to spread on the dough? It just says “1/4 raw honey”. Hi Jeff, Yes, 1/4 cup honey is correct. I’ve wanted to try soaking grains, but I just can’t get past leaving the milk out all night! Are you sure it would work with regular store bought milk? Organic, but pasteurized and homogenized. Hey Jessica, I was scared to leave milk out at first. As long as it’s mixed with an acidic medium (whey, vinegar, lemon juice) it is just fine, as long as it doesn’t exceed the 24 hour mark, even if it’s pasteurized and homogenized. I believe this recipe would also work well with water vs. the milk, so you could also try subbing 1 cup water instead of the milk. Then soak accordingly. I tried this recipe a couple of weeks ago & it didn’t turn out for me. The bread never rose well so it was pretty dense and didn’t taste great. I am not sure what I did wrong. Hi Lisa, sounds like something went wrong with the yeast. Possibly a bad batch of yeast. An active yeast will cause the dough to rise and produce a light and fluffy wheat bread. The dough should double, nearly triple in size after the rising, about an hour after adding the yeast. Without the yeast properly working, the bread will be dense and effect the overall taste. When do I know that it is done soaking? Or can I proceed right at the 12 hour mark? Hey Claudia, The 12 hour mark is usually considered proper soaking time, but a bit less (10ish) or more is acceptable too. Have you ever made this using other grain flours? Just wondering if you can sub the 5-6cups ww for other flours? Hey Cindy, I’ve used spelt, whole white wheat, whole wheat, and played around with einkorn. Einkorn is a bit sticky and tricky, but all the flours work great in this recipe. The flour needs to contain gluten for this recipe. Did you have a particular flour in mind? Does it have to be whole milk? I have 2% and unsweetened vanilla almond milk. Can I use either of those? Hey Rachelle, I think 2% will work well in this recipe. Enjoy!! Thank you for answering me so quickly. I’m attempting this for the first time tonight. I’ve made bread machine bread but this is a whole new level of homemade baking for me. My parents are driving 12 hours to spend Thanksgiving with my family so I’m hoping to impress them with some homemade bread. I’m super nervous but ready for the challenge. Thanks for providing the help and recipe! This bread is so good! Thank you for sharing! I’m pretty intimidated to start baking my own bread because I wouldn’t classify myself as a “baker.” But I think I have to try this. How long did it take you to get into the routine of making bread on a weekly basis? Hey Holly, At first baking bread took some time to get used to. I must admit, I still on occasion purchase bread at the market or natural food store, but when I’m in a routine I find baking bread becomes part of the schedule of things to do. Generally, I’ll bake four loaves on a Sunday and then cut each one in half, freezing each half. I find this works well for our family. I accidentally added honey to the initial soaking stage. Would this ruin my bread? Nilofer, The honey shouldn’t ruin the bread. I think the early addition is just fine :). I am so eager to try this bread! This is my first time making yeast bread. Yeast has always deterred me because it sound so temperamental. I cook for one so a two loaf recipe is a bit much, so I thought to just freeze one. No big deal except for deciding between the whole grain and the cinnamon raisin. So, I decided to make two hybrid loafs. Both are half whole grain and half cinnamon raisin. They are in the oven now and I am very excited to see how/ if it turns out! Hey Jessica, Freezing the extra loaf is a great idea! I’m excited to hear how your loaves turned out. Congrats on your first yeast bread!!! Hi, I live in the desert so I had to add about an ounce more water to the soak and bake it for slightly less time. It turned out wonderful! I’ve never made whole wheat bread that raised so well and was so soft and fluffy! Thank you so much! Hey Bethany! I’m so happy to hear your bread was a success!! Thank you so much for sharing the desert tip, I know that will help future readers/bakers. Enjoy the fresh bread :). What if I use water to soak my WW Flour and life happens and it soaks for longer than 24 hours before I make the bread? It soaked for 28 hours before I put it in the fridge and I was hoping it wouldn’t be ruined if I made it the next day..? It doesn’t smell funky to me..
Hey Bethany, It should be okay :). As long as the dough doesn’t smell funky, I would use it! I am baking this bread right now! How many cups of flour do you usually add to the mix? I have added over 4.5 cups and it is not sticky, but looks dry. Thank you! I hope it turns out. Hey Caitlin, I usually add just enough flour so the dough is easy to handle, but not too dry. This amount varies a bit each time I make bread. If it’s too dry (the dough) you can add a tablespoon of water at at time during the kneading process. Let me know how it goes! The bread is in the oven as we speak! It doubled perfectly and turned out great! Thank you! I’ve always been afraid to make my own bread! Awesome job, Caitlin! I hope the bread was super delicious! This looks delightful! I’m getting hungry! I just recently gave away my bread machine. 🙁 I have been trying to get into bread making for a couple of years now. I love it, but none of my recipes “work” and my husband complains that it’s too dense. He prefers the light, fluffy, store-bought bread. 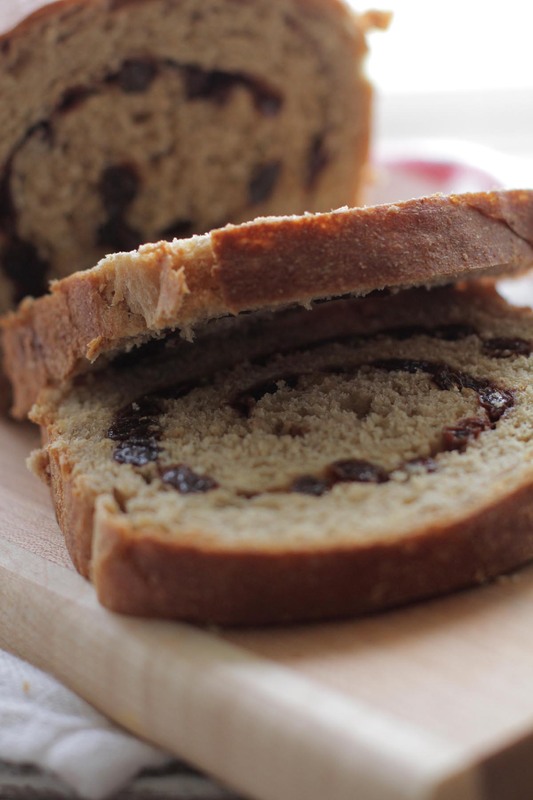 I really do want to try this recipe, though…hmmm…Raisin bread is usually more dense than “sandwich” bread. Hey Monique, I know exactly what he means…whole wheat can be so dense. I really like soaking wheat for bread since it seems to soften the wheat (like this recipe). I also love einkorn for bread-making since it’s more like white flour in taste and texture, but it’s an ancient whole grain. 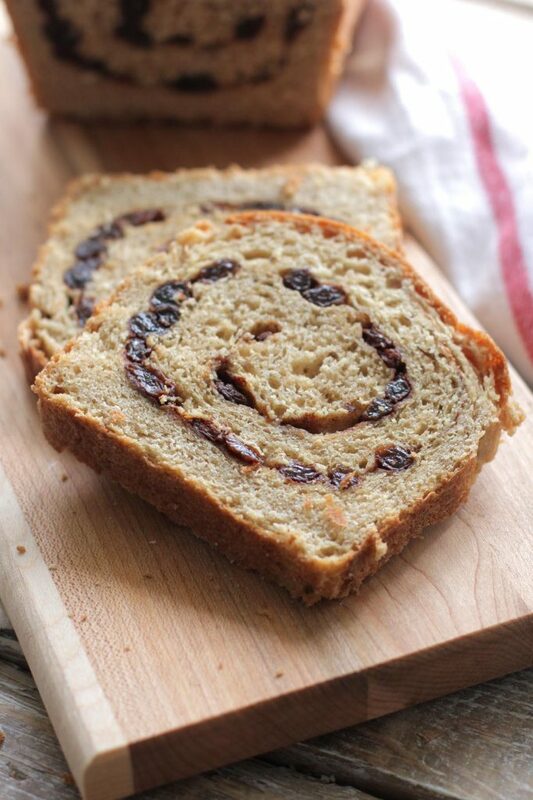 I plan to share a few bread recipes for einkorn in 2016. I have everything but the apple cider vinegar. Do you think white vinegar, red wine vinegar, or lemon juice can be substituted? Hey Jessica, White vinegar or lemon juice will work :). I love this recipe so much. It’s become a staple in our house. We had cut out bread for health reasons, but we are on board with this soaked grains version. Thank you!! That’s awesome, Sarah! I’m so glad the bread is a staple in your house :). I am excited about trying this recipe, but I feel like I missed something. Do you literally soak the dough, or is the process of allowing it to sit for so long called “soaking”? Thank you for the reply. And now I know 🙂 Can’t wait to make it tomorrow! Whoa Mama! This was an amazing recipe! I only have one Loaf pan, so I made 2 longer loaves in a glass 8×11 pan, and it came out wonderfully. I would post my pic, but I don’t know how. Thanks! Can’t wait to share with my 1-year old daughter. Yay, Mandi! I’m so glad you loved the recipe :). This recipe looks gorgeous and I really want to try it! However I was just wondering if the soaking of the bread will not be suitable for the kind of hot, tropical climate that I live in. It can get really hot, up to around 34 degrees Celsius where I live. Do you think that the soaking the bread will still be okay to do? Thank you so much! I am ready to try again. How do you store this bread? On the counter in a bag? Hey Lisa, I store the bread in the fridge for a few days, or in the freezer for a few months. Thanks, Kristin. Do you wrap it in parchment paper and then put in a bag? My husband is not a big fan of freezer food so anything I can do to ease the process…. 🙂 Bread is in my mixer now. Hoping it turns out!! Hey Lisa, Yes, parchment paper helps. If you’re okay with plastic wrap or foil (they can serve a good purpose for freezing), they are best to keep the freezer burn out of the food. Then, place the bag in the freezer. I also like to cut the loaves the half before wrapping and storing them in the bag (and freezer). Hi–I have always wanted to try baking bread but have been intimidated. This recipe is encouraging me to give it a try. One question. In steps 5 or 6, you say “Roll the flatttened dough into a loaf and place in a buttered bread pan.” if it’s flattened, how do you roll it into a loaf? Thanks! Hi! I’m making this bread right now, so just starting the soaking process. I added the correct amount of liquids as outlined in the recipe and the 5 1/2 c of whole wheat flour. My mixer couldn’t get it all mixed! It’s super dry and crumbly and there’s about a half cup of stuff that just can’t seem to get incorporated into the rest. What did I do wrong? Can I fix it or is it ruined? Thanks! I’m anxious to try this and start using homemade bread instead of store-bought. Hey Mary, I would add more liquid (milk or water) until the dough is soft and pliable. Next time you may need to start with only 4 1/2 cups of flour and work your way up to the amount needed for your flour, based on the feel and look of the dough. Let me know how it goes. Thanks so much! 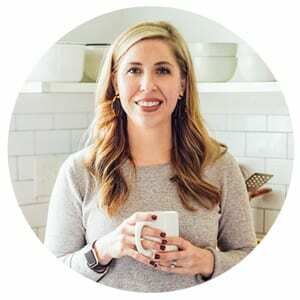 I love your site and hoping to start the transition to a fully real food kitchen. What size loaf pans does this recipe call for? Thanks! Hey Lisa, I use a large loaf pan, about 9 1/4 x 5 1/4 inch. Could you use the whole wheat Eikorn flour? Hey Kathleen, That’s a great question! I think you could. I’m not sure if you’d need to adjust the amount of flour needed–you could try the amount in the recipe and then add more based on how the dough looks/feels. Let me know if you try it! 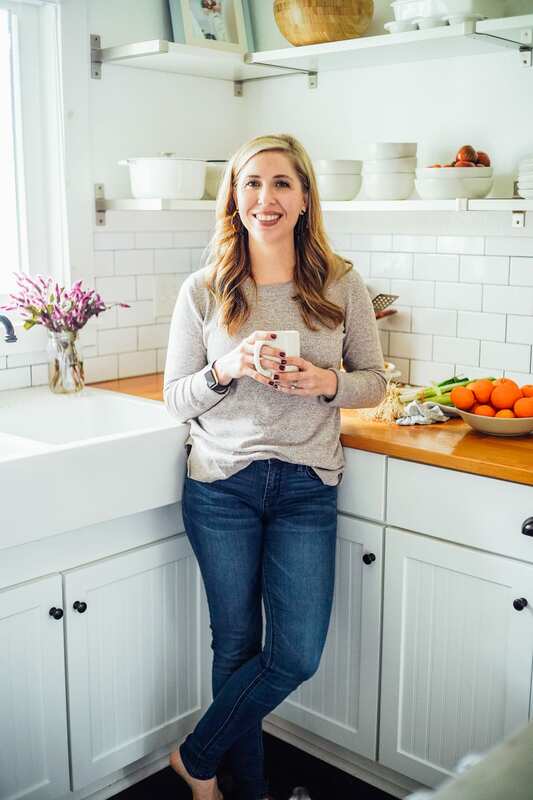 Also, I’m glad you asked this–I’m going to add an einkorn cinnamon roll recipe to my list for the late summer/early fall!